RF: I have a lot of food sensitivities, so if if I have some choice in where we go out to eat, I will often offer a recommendation of a place where I know I there is food I can have. In fact, sometimes I take the opportunity when someone says "Let's do dinner!" to just suggest they come over and I'll cook for them. That way, I have complete control over the ingredients and cooking method, it's cheaper than going out to eat, and I don't have to battle traffic to and from a restaurant! If I don't have any say in where we are going out to eat, I just ask a lot of questions of the server in a very gracious manner and let them know my requirements. There's usually at least one dish on a menu that I can have. Failing all of that, you can always just ask the restaurant for a bed of salad, no dressing, with some sort of protein, such as a grilled chicken breast, on top. You can ask them to cook it in butter instead of canola oil. I know of other people that bring along a small little bottle of high-quality olive oil to use on salads, because nearly all restaurant salad dressings will have junk oils. Even if you ask for the little bottles of olive oil and vinegar, there is a lot of "scammery" in the world of olive oil and it's likely cut with vegetable oil. Just use the olive oil from a source you trust. I will say you do need to be willing to be "the weird one" sometimes. But your health is more important than worrying about what people will think of you if you carry a bottle of olive oil in your purse at the restaurant! CA: Most memorable restaurant meal in (or near) Vancouver? RF: My husband and I had our first sort-of date at Cultured Caveman while we were both attending the Nutritional Therapy Practitioner course in Portland through the Nutritional Therapy Association (he contends it was a date; I tell him, "No, that wasn't a date.") Since then, we have had MANY real dates there, and it will always hold a special place in our hearts! CA: Most memorable restaurant meal outside of Vancouver? RF: There are so many! 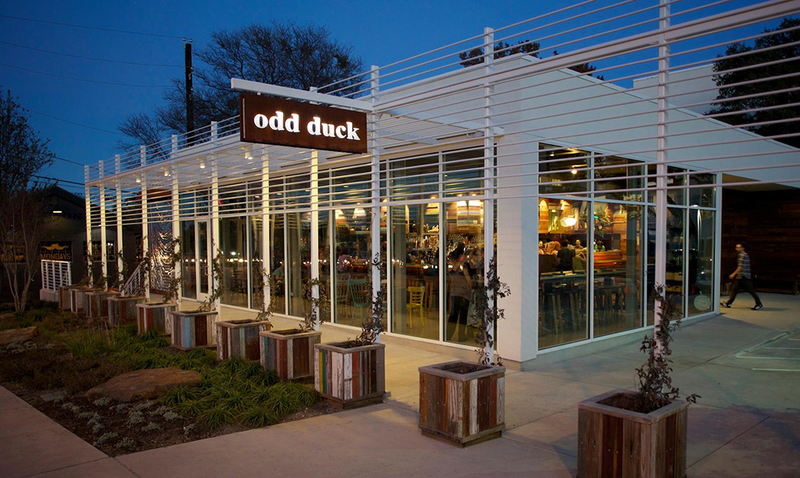 I recently fell in love with Odd Duck in Austin on a work trip. They had this black sesame panna cotta that was so good, it made my colleague literally shed a single tear of joy. It makes me crack up again just thinking about it. RF: I recommend being exceedingly gracious. A little self-deprecating humor seems to go far: "I apologize in advance, but I am one of THOSE annoying people that is allergic to everything. I have sensitivities to [gluten/eggs/dairy/nightshades/whatever]. If I tell you a couple dishes I'm interested in on this menu, could you tell me if those would be something I could have?" Note that you're not saying, "What can I have on this menu?" because you are going to make them have to mentally run through every ingredient in every dish on the menu. They are already busy (can you tell I've been a server?) and trying to remember 37 other things at the same time they are taking your order. Just give them two, and if neither of those suit, ask them if they have recommendations for making substitutions or omissions to suit your needs, e.g. "if you leave the sauce off, it's gluten free". If they say, "I'm not sure; I'll have to ask the chef," you just smile and say, "Absolutely; I appreciate you asking for me! Thank you!" Most importantly: if you live in a place where it's customary to tip, always, ALWAYS tip well. In addition to the tip (not instead of), you can say to the server before you leave, "Thank you so much for being accommodating; I appreciate it!" RF: I've been toying with Intermittent Fasting, and it is honestly one of my favorite hacks for traveling. When your blood sugar is so dialed in, your body can easily tap into fat stores, and you can skip a meal if it's not convenient to eat or you can't find anywhere to eat. It's absolutely effortless. But, if I do need something to eat, sometimes I will bring along one of my homemade meat protein bars or some of the Primal Kitchen collagen bars. I also often have a can of sardines and a wooden utensil set in my laptop bag when I travel, just in case. RF: One of the quickest meals that my husband and I have regularly is just ground beef or ground pork and wilted greens like spinach. You just get a pound of ground beef or pork and brown it in a big pot, sometimes with some diced onion thrown in. When it's browned, we add in a ton of greens and let them cook down. Sometimes we will add in other leftover cooked vegetables, like diced sweet potato or zucchini, or if we want a little starch, some leftover cooked white rice or buckwheat (which is not related to wheat; it's actually a seed). If we're doing something like that for breakfast, I'll add a fried egg on his and put a little sauerkraut on the side of each of our dishes for some probiotics. RF: With alcohol, I could take it or leave it. My husband and I decided to do a dry 2018, partially as a way of being healthier, but also as a way of saving money. We've reduced our grocery budget tremendously in an effort to pay off debt and get to financial independence. I do think there are times where having a drink adds richness to experience and life, and it's therefore worth the negative health effects, like sharing a nice bottle of red wine with close friends over a long evening dinner. Moving forward after this dry year: I proposed to my husband the idea of using a "token" system where we each get 6 tokens for the year that you can "spend" on alcohol whenever you want. (Why 6? It's totally arbitrary. It just popped into my head and seemed about right.) I like this idea because it helps us be more discerning, consciously choosing the alcohol to have that richness of experience, like birthdays, holidays, or a dinner with friends, rather than, "Well, it's Tuesday; pass the bottle opener!" I also like the token system over deciding something like, "I will only have alcohol on my birthday, my spouse's birthday, and Christmas", because of course other things will come up that you didn't anticipate (like those friends you haven't seen in ages coming into town to visit you! ), and those are events that are worth savoring, too. Information: "I've been offered homemade popcorn for movie night with my family, but I know that corn makes me break out." Consequences: "If I eat this popcorn, in 72 hours, I will have acne on my forehead and chin. Do I want to do this?" Choice: "Yes, it's worth it for the experience" or "No, I have an event to go to in a few days and I'm unwilling to deal with those consequences." I became a certified Nutritional Therapy Practitioner (NTP) and founded Flourish Fundamentals (FlourishFundamentals.com) to empower women to take back their health through honest education, delicious real food, and loving self-care. I give women the knowledge, tools, tips, and recipes they need to feel energetic and radiant. I do this through public speaking, educational events, my website, and books. My latest book is "Eat Your Sunscreen: Superfoods to Boost Your Skin's Natural Defenses Against Sunburn", a complete guide to summer sun safety. My first book, “Radiant Reboot: Reclaim Your Health, Increase Your Energy, and Reboot Your Life in 30 Days”, is a self-guided 30-day real food program to help you jumpstart new habits and integrate the fundamentals of health in a way that is fun, entertaining, and practical, so you can make informed decisions for yourselves and your families about how and what to eat. My approach helps increase energy, balance hormones, eliminate sugar and carb cravings, clear up skin, boost libido, and improve digestion, mood, sleep, and clarity of thought. And as an added bonus, your pants will fit better, too!